Bug-controlled robots may help detect danger. Robots are awesome, and that's pretty much a concrete fact at this point. But you know what's even more awesome? A creature that (probably) has no idea what it's actually doing, driving a robot around. Researchers at the University of Tokyo clearly agree with this assessment, and to prove the point they strapped a moth to a tiny robot and recorded the results. But as cool as the concept may be, there's some serious scientific research going on here as well. 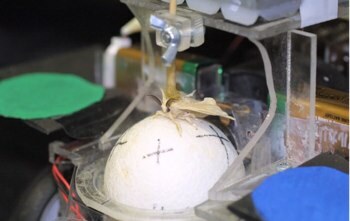 The moth essentially works as the brains of the robot, and can be used to track down certain smells - in this case, the pheromones from a female moth. When the moth walks towards the scent, it turns a foam ball that drives the robot in a certain direction. As the comparison clip shows, the moth is even capable of overcoming a turning bias that was instituted to make the task more challenging. Eventually, researchers hope that this experiment is just a step towards using similar bots to detect chemical leaks and other dangers. But for now, the cool factor is enough to keep us enthralled.